Your own hoodie with your designs and photos on it, it's possible in less than five minutes. Never again will you run into another man with the same hoodie as you, when you start making your own custom hoodies. Great quality hoodies using your own photos, for the perfect hoodie designed by you and created by us. Our specially designed Customizer and years of custom printing experience culminate to make it possible for you to make your own hoodie. We’ve worked hard to make the process as easy as possible for you while still providing high-quality men's hoodies and high-resolution prints on them. 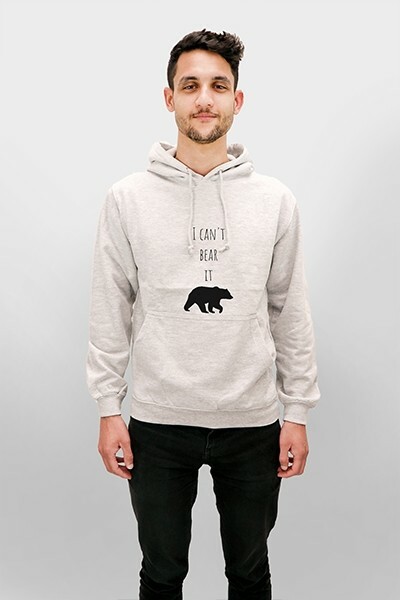 Create the great design you’ve always had in your head, that funny hoodie for your friends birthday, or the stylish look you could never find on the racks. Custom hoodies also make great personal and sometimes funny gifts. The possibilities are endless and only your imagination limits you. Design your own hoodie today! No need to be a graphic designer. You can create custom hoodies very easily using our specially built Customizer. In three simple steps, you’ll have a one of a kind hoodie that fits your personality. Choose the hoodie and the correct size from our collection. Upload a design or photo via your phone, computer, or social media accounts, like Instagram or Facebook. You can use any kind of image, as long as it is a PNG or JPEG. Finally, make any image adjustments, add some text or emojis, and finalize your design. Double check your order before you complete it to make sure it’s all correct. Create your own hoodie in just five minutes. Once you have finished your design and checked out, it will be printed on the front of the hoodie in full color and in a variety of sizes. After your hoodie has been printed and checked for imperfections, we’ll box it up and ship it to you. We’ll also send you a tracking code, so you can track its progress and know exactly when it will arrive. If only everything in life were this fast and easy. Before placing your order, please make sure to carefully verify all your order details. Create your own custom hoodies for men today and make people jealous.